Whether you’re moving down the street or across the country, moving house can be a lot of work. While settling in is generally easy for us humans, it can be much more difficult for our pets. Dogs, cats and other common pets often struggle to adjust to living at a new address – especially if it’s far from your old home. Owners should provide their dog with special attention during the moving process to make sure they adjust to your new home. In this guide, we’ll share seven tips to help you successfully move house with your dog. From favourite toys and blankets to the right tone of voice, some of the most effective ways to help your dog adjust to a new address might surprise you. Dogs thrive on comfort and familiarity, and changing their environment by packing away furniture and other items can stress them out. Start packing early and box items step by step to avoid radically changing your dog’s living environment. A great way to pack is by sorting and packing one room at a time. Start by packing up furniture and other items in the rooms your dog spends the least amount of time in, then move on to the living room and other frequently used spaces. When moving day arrives, bring your dog to your new home after you’ve moved in and unpacked most of your items. Once they see their favourite sofa, armchair and blanket, they’ll start to feel more at home in your new house. A great way to make the moving process less stressful for your dog is by keeping it in a safe, comfortable room while you move everything out of your home. Provide your dog’s favourite toys and other items to make sure they’re comfortable. Put a “do not open” sign on the door so that the movers know not to enter as they pack and transport your possessions. This way, your pets won’t see your home’s items – things they associate with their home – getting moved away. Pop in to check on your dog every now and then to make sure they’re alright, but don’t let them out into your house until you’ve finished moving. Letting your dog walk about your house while you move can be dangerous and lead to accidents. If you have several dogs, or a dog and other pets, keep them in separate rooms on moving day to prevent any territorial clashes. Moving is stressful for pets, and it’s often made even more stressful by spending time around unfamiliar animals. Put one dog inside one bedroom and the other inside another if they’re not used to each other’s company. If your dog and cat are constantly chasing each other around the house, make sure they’re separated. This is especially important if you have a dog and cat, or different combinations of pets. Cats are often even more stressed by moving than dogs are, making it vital to keep them separated from other animals and comfortable during moving day. Before you move, think about having your dog microchipped. Dogs often respond to smells and sights that are familiar with them, and could run back to your old address after seeing or smelling something that reminded them of it. Microchipping your dog makes finding them, in the event of a disappearance, much easier than it usually would be. It also gives you extra security once you’ve settled in, should your dog ever go missing in the future. If your dog is already microchipped, make sure you contact the company and inform them that you’re moving. This way, they won’t accidentally think that your dog has run away from home upon seeing it at a new location. Dogs love familiarity, and finding it in a new home can be difficult. Make the moving process easier by giving your dog its favourite bowl, toys and blanket after you’ve finished moving into your new home. These things might seem small, but they’re a big deal when you’re an animal in an unfamiliar environment. Even the smell of your dog’s old toys makes a difference and helps them associate their new living environment with home. Set up your dog’s sleeping area as soon as you’ve moved in to help them form new habits quickly. Having a comfortable spot to relax and sleep lets your dog become familiar with your new home faster, preventing it from feeling stressed out. Dogs need to spend time outside, and taking them on short walks around your new neighbourhood is a great way to familiarise them with the area and give them the exercise they need to be happy and healthy. Start with very short walks – around the block or for five to 10 minutes near your new home. The goal of short walks is simple: to make your dog more familiar with its immediate area and prevent it from running back to your old home. 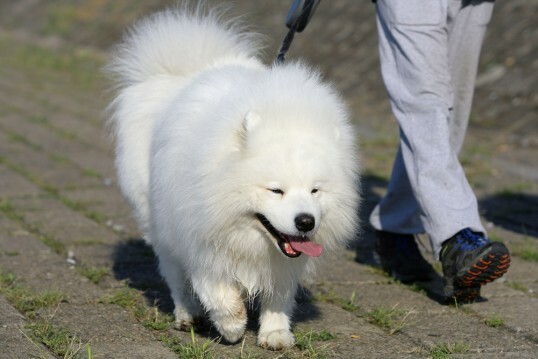 After a few days, increase the size of your walks to give your dog a better view of its new neighbourhood. After a few weeks of walking, your dog will feel comfortable in its new surroundings and the risk of it returning home will have decreased. The key to a stress-free moving day with your dog is communication. While your dog may not understand what you’re saying to it, it can understand your tone of voice and associate it with a certain emotion. Use a calm, relaxed tone of voice when you talk to your dog during moving day to trigger calm, relaxing emotions. Use the same commands you normally would, as doing so gives the day a sense of sameness and makes it seem more ordinary. Once you’ve moved in, avoid stressing your dog out with loud noises or anything else that could startle it. Keep calm and be as relaxed and friendly as possible and your dog will mirror your cool and collected attitude. Have you ever moved house with your dog? Moving house with pets is tough, but it’s far from impossible with the right mix of preparation and on-the-day techniques. Have you ever moved house with a dog or cat? If so, what technique did you find the most helpful for keeping them calm?